Finally - Arkansas has a coach! 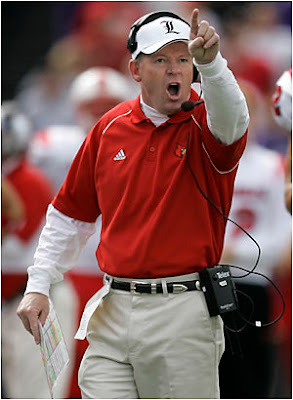 Bobby Petrino quit the Atlanta Falcons today and is headed here to be the next coach of the Hogs and I could not be more excited! So excited that we ordered a celebration pizza!!!! HALLELUJAH! I celebrate with ya my fellow Razorback gal. And, the pizza looks scrumptous....i wish I could have shared with ya!!! Welcome to Arkansas, Coach! And, yes...a championship would be good. Lane is so excited about this news! Hit that line, hit that line, keep on going! Move the ball right down the field! Give a cheer, RAH! RAH! Never fear, RAH! RAH! Arkansas will never yield! On your toes Razorbacks to the finish. Carry on with all your might. For is A-A-R, K-A-N, S-A-S for Arkansas, FIGHT! FIGHT! FIGHT! Thanks for keeping me abreast of Arkansans news. It's definitely not front page stuff around here! I am so excited! We actually have a chance next year! I was almost ready to turn in all my red. Kelly, thanks for all the comments on my blog while I have been recovering...you are so sweet! I just caught up on the past few weeks of your life. Looks like you have been having some Christmas fun! I LOVE the decorations & that coffee punch looks so delicious! Congrats on the new coach & can I please get a large pizza at my house STAT!! I would like for you to know that your blog is my source for Razorback football news. Welcome Bobby! my husband is very excited too!